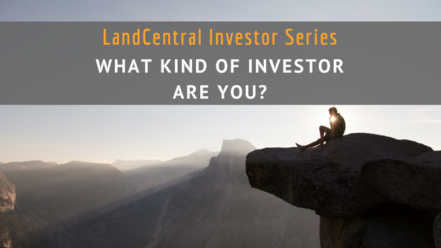 Home | Land University | Investing In Land | What Kind of Investor Are You? You’re ready to get in the game but you don’t know where to start. You crave financial freedom. Some of your friends have made money in real estate and you want in. But you’re cautious. Money doesn’t grow on trees where you come from so you want to take it slow. Say no more. Our brand new Investor Packs offer the hand holding you need to get started. Beginner Packs bundle multiple properties for as low as $8,000 and no more than $20,000. No experience necessary. You’re no stranger to the real estate game. You started small, followed the rules and even made a little profit along the way. Now you’re itching to grow. Well LandCentral’s got you covered. Thanks to our Investor Packs, you’ll find the perfect opportunities to take your investing skills to the next level. Intermediate Packs run between $20,000 and $50,000 for a bundle of awesome properties. Some experience required. This isn’t your first rodeo. Your loans are paid off, you own your properties outright, and you’re even cash flow positive. You’ve bought and sold properties like a boss and now you’re ready for more. Whether you use your appreciation for growth or partner with other big shots to buy bigger properties, our Investor Packs can help! What are you waiting for? Bring those savvy skills to the table.